Yunuen Perez grew up in Cholula Puebla which contains the Great Pyramid, Tlachihualtepetl (Nahuatl for “made-by-hand mountain”), dedicated to the god Quetzalcoatl. 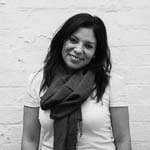 In 2007, she moved to Melbourne, deciding to study at the Victorian College of the Arts. 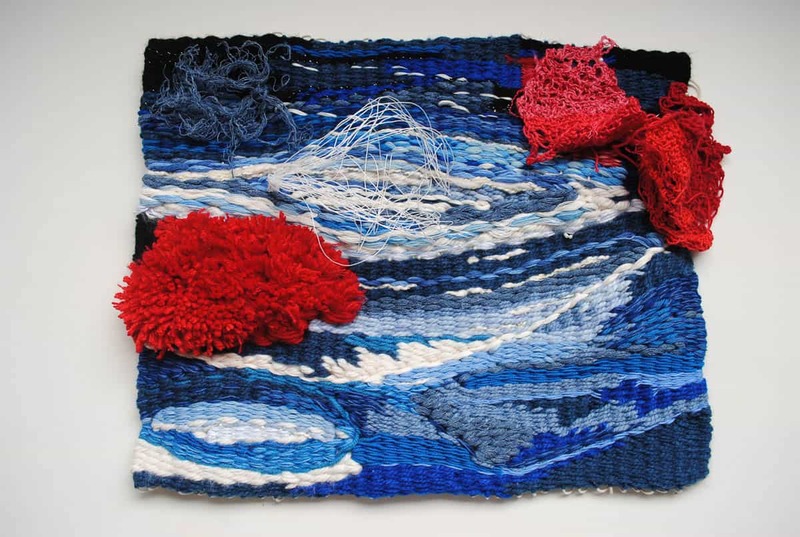 While working as events coordinator at the National Gallery of Victoria, she developed a body of tapestries The Language of Colour: A Textile Journey that was exhibited as part of Melbourne Design Week at fortyfive downstairs gallery in March 2018. These works sought to translate Nahuatl stories into a new medium. ✿ What was your reason for learning to weave? 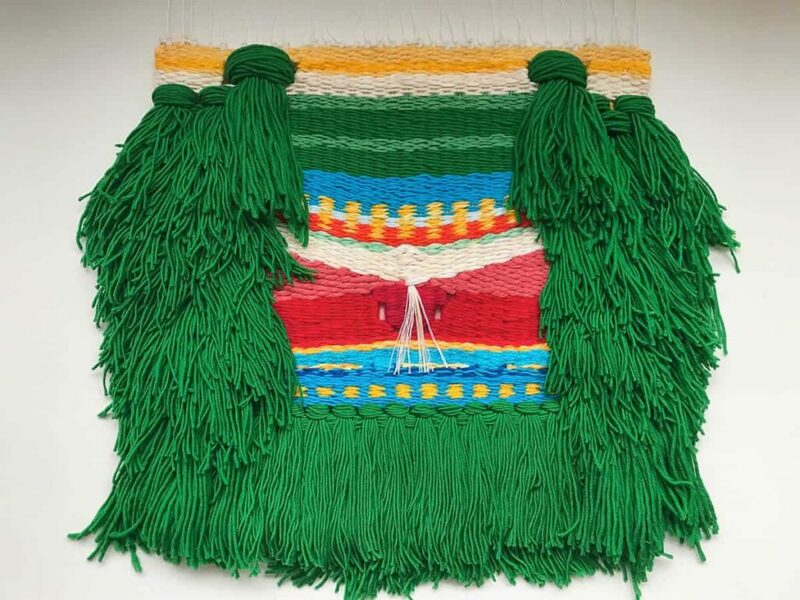 Indigenous groups in Mexico have unique weaving techniques and patterns, usually representing local animals and flora, architectural patterns from archaeological sites, religious and mythological symbols. For a very long time, I have admired the intricate and complex textural qualities of Mexican textiles; and like many other artists and artisans, I found my artistic individuality in this medium. I was eight years of age when I wore my first traditional Mexican indigenous dance costume as I was part of a folkloric dance group in my primary school. I remember wearing a long and heavy off-white canvas skirt and a matching huipil (blouse) with detailed embroidery along the collar. A bright red hand-woven cintilla (belt) wrapped my waist and fell gracefully on the skirt. I remember the experience of wearing this traditional Mexican indigenous costume as a proud moment of connecting with my culture and its vast traditions. I am a self-taught weaver. I learned how to weave in Australia about four years ago when I was following patterns from Mexican indigenous costumes like the embroidery pattern from my childhood costume. I experimented with shapes, colours and different yarns brought from Mexico; and learned about technique and patterns by reading specific books by lead academics such as Walter F Morris. As I embarked on this journey, I felt deeply connected with childhood memories that took me back to markets in Cholula, Puebla where farmers from nearby regions bring their fresh produce to sell on a Plaza day. The streets of this Pueblo Mágico (magic town) are covered with beautiful hand-sewn tablecloths, and local fruit and veggies lay on, the women wear hand-embroidered aprons, and stalls sell hand-woven textiles and clothes for domestic use. I also revived the experience of attending the Guelaguetza, the largest Indigenous festival in Oaxaca, where hundreds of regional indigenous men and women dress in their traditional costumes gather in the state capital to celebrate diversity and their unique cultural groups, by dancing folkloric dances and showcasing their textile and crafting traditions. Through my tapestries, I feel closer to the history and linkage of my Mexican heritage. ✿ What are some of the images or designs that inspired your series of tapestries? Finding inspiration for my tapestries is a journey in itself. I am passionate about contemporary, traditional textiles from México, Perú and Bolivia, but I also study textiles and clothing pieces from ancient Mesoamerican groups, fabricated with natural fibres, feathers and shells. 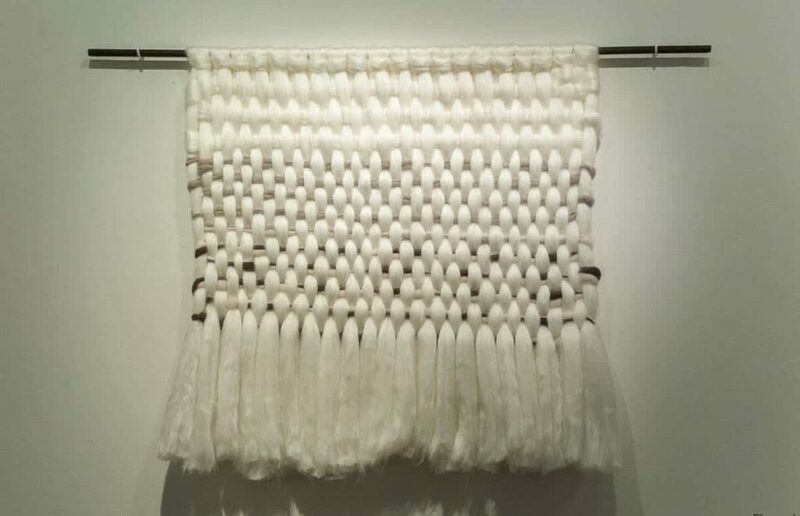 Ever since I have started my weaving journey, I have learned about and from international textile artists such as Sheila Hicks, Anni Albers and Olga de Amaral, who is not only a source of inspiration but a role model. The Language of Colour: A Textile Journey is a group of fifteen hand-woven tapestries I wanted to connect and depict some of my treasured memories of Mexico on the loom. Imagery such as travelling through a mountain range in Central Mexico; numerous visits to different archaeological sites as well as the Museum of Anthropology and History in Mexico City; my first encounter with an Aztec warrior hand-woven uniform; my parent´s house in Cholula, and many others are represented abstractly. The images and designs in my tapestries contain a portion of a treasured memory, and I interpret and adapt it into the two-dimensional medium. ✿ What do you hope to achieve through these works? With my artwork, I seek to illustrate some of my memories and experiences in an artistic vocabulary, thus creating a dialogue between an ephemeral concept and a material object. As a Mexican-born, Australian based artist, I am also interested in the intersection of my two living experiences and how both converge to represent my heritage and artistic roots in a new setting, addressing similar concepts, such as family, community, belonging and mobility. “I remember the experience of wearing this traditional Mexican indigenous costume as a proud moment of connecting with my culture and its vast traditions”. Being Mexican and from a similar background as Yunuén, I must say that her story fascinates me, specially because I myself never have the chance to connect with my country’s roots as such a young age. 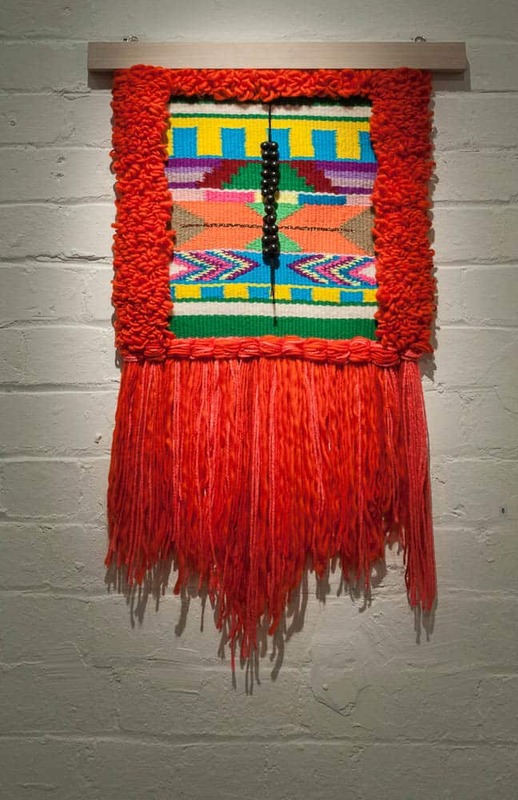 On the other hand, her works strikes the eye thanks to its rich simplicity, if you pardon the oxymoron; it is also, at the same time, a true copy of the Mexican textiles style and a whole new version of it. Congratulations on the article and the work!